Why do some women struggle to identify as feminists, despite their commitment to gender equality? How do other aspects of our identities – such as race, religion, sexuality, gender identity, and more – impact how we relate to feminism? Why is intersectionality so important? In challenging, incisive, and fearless essays – all of which appear here for the first time – seventeen writers from diverse backgrounds wrestle with these questions, and more. 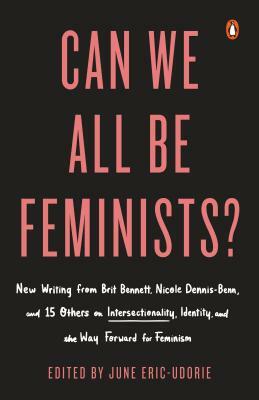 A groundbreaking book that elevates underrepresented voices, Can We All Be Feminists? offers the tools and perspective we need to create a 21st century feminism that is truly for all. June Eric-Udorie is a twenty-year-old British writer and feminist activist. Named Elle UK’s “Female Activist of the Year” for 2017, she has been included on lists of influential and inspiring women by the BBC, the Guardian, and more. A co-founder of “Youth for Change”, an initiative that works to combat female genital mutilation and forced marriage around the world, her advocacy has taken her to classrooms, the Southbank Centre's Women of the World Festival, the United Nations, and more. In 2015, she spearheaded a successful campaign to overturn the British government’s decision to remove feminism from the nationally mandated A-level (high school) politics syllabus; more recently, she raised funds to take five hundred underprivileged girls and young women of color to see the film Hidden Figures. Her writing has appeared in the Guardian, the Independent, New Statesman, the Telegraph, ESPN The Magazine, and Fusion, among others. She is currently an undergraduate at Duke University, where she is a recipient of the University Scholars merit scholarship, established by Melinda French Gates, and a Human Rights Scholar at the Kenan Institute for Ethics.